Çiçek Pasajı (Flower Passage), also known by its French name Cité de Péra, is one of the many historic buildings that adorn the avenue. 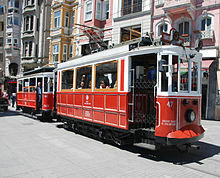 İstiklal Avenue or Istiklal Street (Turkish: İstiklal Caddesi; Greek: Μεγάλη Οδός του Πέραν, translit. Megali Odos tu Peran; French: Grande Rue de Péra; English: "Independence Avenue") is one of the most famous avenues in Istanbul, Turkey, visited by nearly 3 million people in a single day over the course of weekends. Located in the historic Beyoğlu (Pera) district, it is an elegant pedestrian street, 1.4 kilometers long, which houses boutiques, music stores, bookstores, art galleries, cinemas, theatres, libraries, cafés, pubs, nightclubs with live music, historical patisseries, chocolateries and restaurants. In the historic Karaköy (Galata) district towards the southern end of the avenue, it is possible to see the world's second-oldest subway station, generally known and referred to as simply Tünel (The Tunnel) which entered service in 1875. Moreover, one of the finest educational institutions established in Turkey, the German High School of Istanbul (Deutsche Schule Istanbul in German, Özel Alman Lisesi in Turkish) is also located near Tünel. The cosmopolitan avenue is surrounded by an array of historical and politically significant buildings, such as the Çiçek Pasajı (Flower Passage) where small, intimate restaurants and taverns are found; Balık Pazarı (The Fish Market); the Hüseyin Ağa Camii Mosque; the Roman Catholic churches of Santa Maria Draperis and S. Antonio di Padova; the Greek Orthodox Haghia Triada; the Armenian Üç Horan (among many other churches); several synagogues; mosques; academic institutions established by various European nations such as Austria, France, Germany and Italy in the 19th century; and consulates (former embassies before 1923) of several nations including France, Greece, the Netherlands, Russia, Spain, Sweden, and the United Kingdom. During the Ottoman period, the avenue was called Cadde-i Kebir (Grand Avenue) in Turkish or Grande Rue de Péra. It was a popular spot for Ottoman intellectuals, European and the local Italian and French Levantines. When 19th-century travelers referred to Constantinople (today, Istanbul) as the Paris of the East, they were mentioning the Grande Rue de Péra (İstiklal Caddesi) and its half-European, half-Asian culture. With the declaration of the Republic on 29 October 1923, the avenue's name was changed to İstiklal (Independence) for commemorating the triumph at the Turkish War of Independence. Panoramic view of İstiklal Avenue as seen from Galatasaray Square in front of the main entrance gate of Galatasaray High School. This page is based on the Wikipedia article İstiklal Avenue; it is used under the Creative Commons Attribution-ShareAlike 3.0 Unported License (CC-BY-SA). You may redistribute it, verbatim or modified, providing that you comply with the terms of the CC-BY-SA.